Gimmicks can be hit or miss. Whether for visual appeal, thematic tie-ins, or to capitalize on some weird element of a license, lots of board games have a unusual twist to their components or gameplay that are meant to surprise and delight in the name of grabbing the attention of the player. But often, that gimmick doesn’t pay off in a meaningful way. With Planet, the core mechanic is built entirely around a physical component gimmick – but it’s that exact feature that adds strategic depth, engagement, and visual fun. It’s also a tremendously fun and simple-to-learn game that will be welcome at virtually any gaming table. Planet comes to us from Blue Orange, the same team that brought players Photosynthesis back in 2017, which also won placement on our best games of that year. That earlier project, about a growing forest, is a personal favorite of mine, so I was eager to see this newest release. 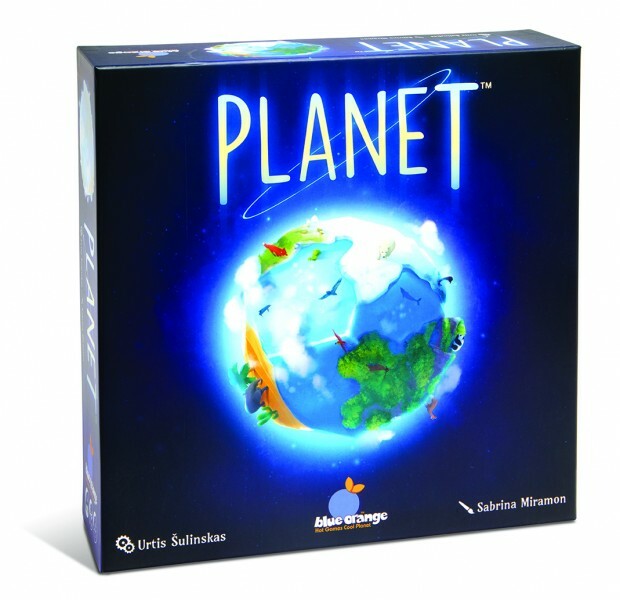 The studio has continued its ecological overtones with Planet, in which two to four players compete to create their own biologically diverse worlds. 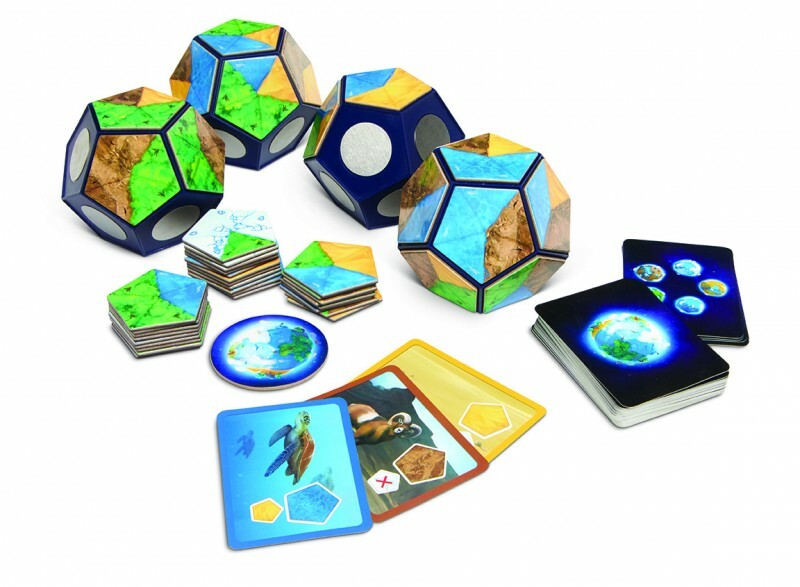 Rather than a traditional board, Planet is played on one of four included dodecahedrons, each about 4 inches across. These roughly rounded plastic shapes fit comfortably in the palm of your hand, and are sturdy enough to toss up in the air, or absentmindedly fiddle with as the game continues, an activity that many players will find uncannily delightful. Each of the 12 sides of each “planet” is magnetic, and the 50 included continent tiles adhere easily. Over the course of the game, you add new tiles to your polygon, and your world begins to take shape, filled with oceans, mountains, forests, glaciers, and deserts. Planet is absurdly simple to pick up and start to play, and it’s one of the things I like best about the game. Young or new players will immediately gravitate to the interesting planet-shaped components and the magnets, and the flow of play is brisk and without complication. 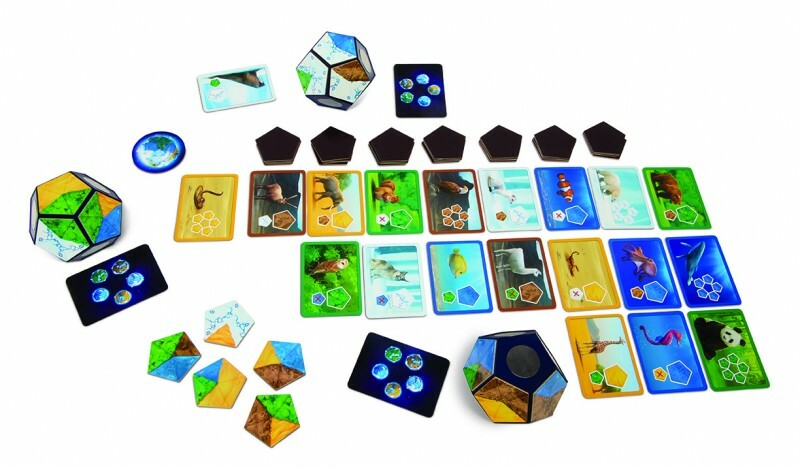 On each of 12 turns (one for each side of your planet) players take turns snagging one of the five available tiles, each of which depicts a different combination of habitats/ecosystems. After the first couple of turns, life begins to emerge, and you have a chance to attract a particular animal species to your planet, represented by face-up cards on the table. Each animal goes to the planet that best matches its habitat needs. The deer wants the largest forest that is bordered by water. The polar bear seeks as many different glacier regions as possible. Each animal has very particular needs, and players can build their worlds with an eye toward meeting those needs. Like many of the best strategy games, complexity arrives through multiple competing objectives and the need for lateral thinking. There’s no way to build the perfect planet, so you must constantly be looking at the upcoming animal cards availble on subsequent turns, and choosing which ones to try and attract. Because you can see all the animals available in a given playthrough (a random 20 of the available 45 animal cards in the box), you must think ahead and decide which ones are worth chasing. In addition, each player also has a secret “natural habitat” that is unique to their planet; you get more points for having a larger surface area of that particular color. Do you double down on getting all the available mountain tiles, or skip one of the mountains so you can snag that desert tile that will attract the scorpion? Or do you simply take the ocean-focused tile, knowing your best friend is trying to get all of those, and you want to deny them to her? 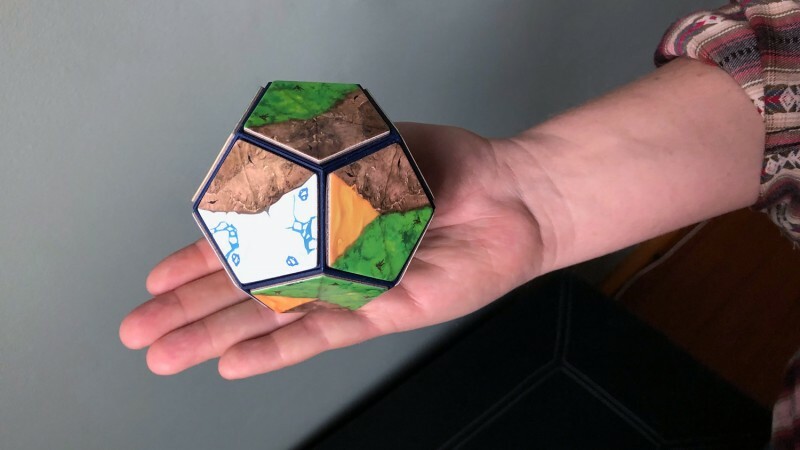 The game could easily have been created to play on a flat map board, with a fairly standard tile or card placement mechanic, but it’s the 12-sided planet components that add another wrinkle, and make Planet far more interesting. As you’re tossing your world back and forth from one hand to the other, you’re also constantly checking out your growing habitats, and gauging your options. Moreover, previously disconnected regions will suddenly meet up with the addition of a new tile, so the three-dimensional nature of the “board” has real impact on the flow of play, and how you place each tile. It’s impossible to observe the whole map in one glimpse, so you are constantly turning and rotating your world to best understand its strengths. And you’re doing the same with your opponents’ worlds, watching as their forest or other regions grow larger, and trying to account for which one of you can draw in that elusive fox, along with all the other animals on offer. Planet’s 12 turns fly by, and even with a full complement of 4 players, it’s easy to get through a game in about half an hour. With attractive animal cards, and planetary globes that become more colorful and attractive as each session unfolds, it makes for a delightful visual display at the table. And while the environmental themes are mostly for effect, there’s a broader message to the game about the interconnected aspects of the natural world and the value of biodiversity, which I quite like, especially as a game to share with kids. With that said, Planet has that elusive quality that makes it a great fit for almost any gaming group, including families, but it’s also welcoming to veteran players who are looking for a lighter-weight appetizer before a longer weekend of gaming. Appropriately, Planet is targeting a release to retail in the U.S. on April 22 of this year, which just happens to be Earth Day. The simple premise and appealing component quality make it an easy recommendation, especially if you’d like to explore a game theme that is off the beaten path from the familiar battlefield skirmish or fantasy adventure tropes. If you’re looking for other recommendations from the tabletop world, I hope you’ll peruse the backlog of recommendations available at the Top of the Table hub, reachable by clicking into the banner below. Alternatively, if you want a personalized recommendation for your family and friends, drop me an email, and I’ll help you find the board game to make your weekend get-together a hit.